Robert and Braden, who have spent a lot of time under Mat's tutelage in the Clearwater kitchen, are doing their cooking and eating in Denmark for the next month and a half. (For their ongoing posts, look for the "Denmark" tag.) Meanwhile, cooking at Clearwater continues even in their absence. 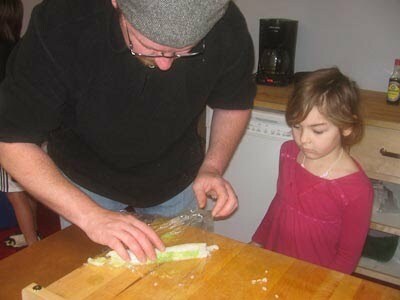 Last week, I loved watching Mat work with a group of nine- and ten-year-olds, who wanted to make sushi and teriyaki to eat. 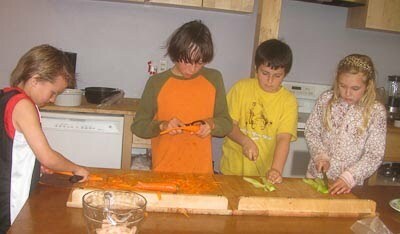 These students don't have the expertise some of our older student cooks have, but they are learning more skills almost effortlessly thanks to Mat's ability to work with students at their particular skill level. 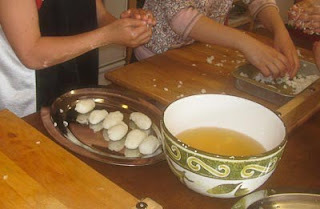 They prepared ingredients, rolled rice balls, cleaned, and had a great time. Plus, the food they made was delicious. Mat purchased some whole squid and the four students cleaned them: removing heads, innards and skin. They were simultaneously fascinated and mildly repelled by the task. They all know a lot more about squid anatomy than they did before. 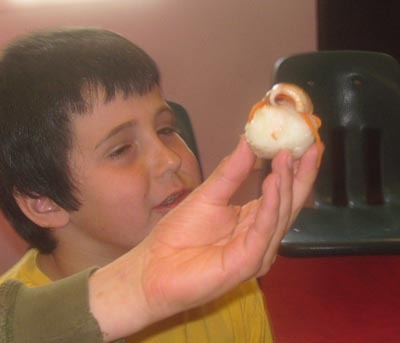 While they were all rolling rice balls, a six-year-old student wandered in to watch and eventually rolled her own rice ball. Watching her watch her older peers so intently reminded me again of the incalculable advantages of a school where all ages share all the spaces throughout the day. 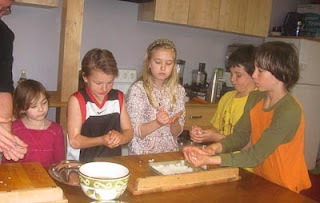 The learning and rich interactions that happen daily because everyone has access to each other all the time are sometimes obvious (as in this cooking class) and and other times more difficult to discern. Click link for more of this post! The younger girl watched the others roll rice balls, stood on a chair to see Mat fry up the squid, then watched him improvise rolled sushi after discovering that the package of nori in the cupboard had disappeared. I later realized she also paid attention when I took photos of a couple of the students' rice-covered hands. The six-year-old asked to roll a rice ball and found out that before she could begin, she had to wash her hands with soap, which surprised her. 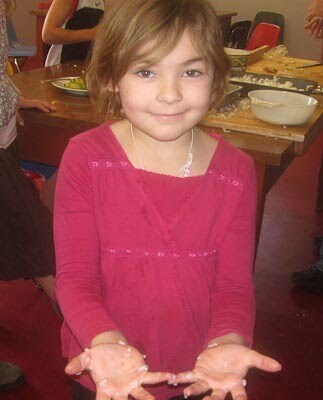 Perhaps she didn't intially see the difference between rice-messy and mud-messy hands. She also discovered that rolling a rice ball was not a slam dunk. She found she had to use quite a lot of pressure to fashion a ball that would stick together. Although the six-year-old girl may have wandered into cooking classes with the teenage students, I don't remember seeing her spend a lot of time watching much older students cook. I suspect what held her interest last week was the fact that the group was only three to four years older than her and what they were doing seemed therefore more accessible and possible. I can guess but don't really know what of her experience that day seemed important to her, what new thoughts will bubble up, or what will ultimately stick with her. It doesn't matter whether I know. What matters is that she was able to be a part of a complex and rich experience that she chose and had meaning for her. 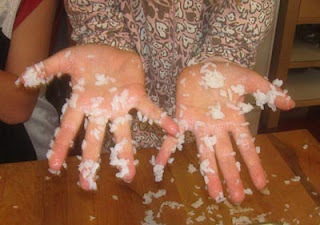 After she was done making her rice ball she came over to me and asked me to take a picture of her rice-covered hands. In addition to whatever she took away from the experience, as a bonus she got to share the experience of having and showing off messy hands.